Coacha is a sports club management software that boasts of a comprehensive feature set designed to simplify and speed up club management processes and tasks. From attracting and signing up new athletes, managing coaches, tracking attendance, monitoring progress, allowing club owners manage their finances, reporting athletic performance, and facilitating payment of club membership fees, Coacha provides users with a comprehensive management platform that is capable of handling all that and more. Coaches can create profiles of their athletes and categorize them based on skill levels, age, gender, etc. The software comes with a feature that set up classes which then generates registers. Email and SMS broadcast functionality allow coaches to communicate to athletes, parents, and coaches by the group or individually. Coacha is a very versatile platform that can cater to small sports clubs, schools and college teams, and large corporate-sponsored sports organizations. No club is too big or too small. Coacha helps you move from the conventional paper-based practice of tracking and monitoring attendance, managing your athletes and profiles. You no longer need spreadsheets to mark their attendance or tick piles of checklists to see and evaluate their improvement. Coacha lets you do all that and more within a single online platform. With Coacha, you can easily search and view your athlete’s profile to see how they are doing. You can create and manage your schedules easily and not miss a single session. The software also lets you generate class popularity/attendance stats. Managing payments is a breeze. You can send payment requests to your athletes or their parents via email, who then can process and settle payments directly within the email. Gone are the days when you have to call your athletes or send them a letter to remind them of their financial obligations. Coacha’s integration with Stripe makes payment processing so easy and pain-free. They don’t have to leave the email to open a new page and pay. With a few clicks, they can securely settle their payments without having to leave the email. This greatly speeds up and simplifies the payment process, which means you get paid easily and quickly. What Problems Will Coacha Solve? Majority of sports club management software out there don’t have specific GDPR processes in place. Still needing to undertake subject data access requests and more processes. Coacha 2.0 was built around GDPR and therefore helps club owners work towards around 75% GDPR compliance. (The remaining 25% being compulsory external, manual processes that must be undertaken by the club owner). Most clubs come to us pulling their hair out because previous software has been full of hidden fees which were super high. Coacha is one of the only pieces of sports club management software to NOT mark up their fees in addition to the payment processor’s fees. Coacha’s transaction fees are simply 1.4%+20p per transaction. Many members come to us completely paper-based. They’re at a loss where to start at saving time on admin and working with GDPR in mind. They’re worried about member’s data security in messy spreadsheets and are in a bit of a pickle. The easiest way to get their member signup form out to allow members to signup themselves. All they need to do is accept them into the club. 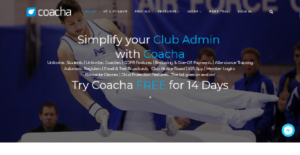 If you are interested in Coacha it might also be beneficial to examine other subcategories of Best Club Management Software collected in our database of SaaS software reviews. Every company has different requirements and requires an application that can be personalized for their size, type of employees and buyers, and the specific industry they are in. For these reasons, no software can offer perfect tools off-the-shelf. When you search a software app, first be sure what you require it for. Read some Coacha reviews and ask yourself do you need basic features or do you need complex tools? Are there any industry-specific functionalities that you are looking for? Find the answers to these queries to assist your search. There are multiple aspects that you need to consider and these include your finances, specific business wants, your organization size, integration needs etc. Take your time, check out a few free trials, and finally zero in on the app that offers all that you require to improve your organization effectiveness and productivity. How Much Does Coacha Cost? We realize that when you make a decision to buy Club Management Software it’s important not only to see how experts evaluate it in their reviews, but also to find out if the real people and companies that buy it are actually satisfied with the product. That’s why we’ve created our behavior-based Customer Satisfaction Algorithm™ that gathers customer reviews, comments and Coacha reviews across a wide range of social media sites. The data is then presented in an easy to digest form showing how many people had positive and negative experience with Coacha. With that information at hand you should be equipped to make an informed buying decision that you won’t regret. What are Coacha pricing details? What integrations are available for Coacha? If you need more information about Coacha or you simply have a question let us know what you need and we’ll forward your request directly to the vendor.